I once tasted a tomato-fennel soup at a restaurant, but it was more like watery tomato sauce; better suited to baked pasta, rather than served as soup. Also, where was the fennel? Apparently it was there in name only. This soup does not have that problem. It is definitely tomato soup, but not like the kind you’d see in a thick ceramic bowl alongside a gooey grilled cheese sandwich in an ad for Campbell’s soup. 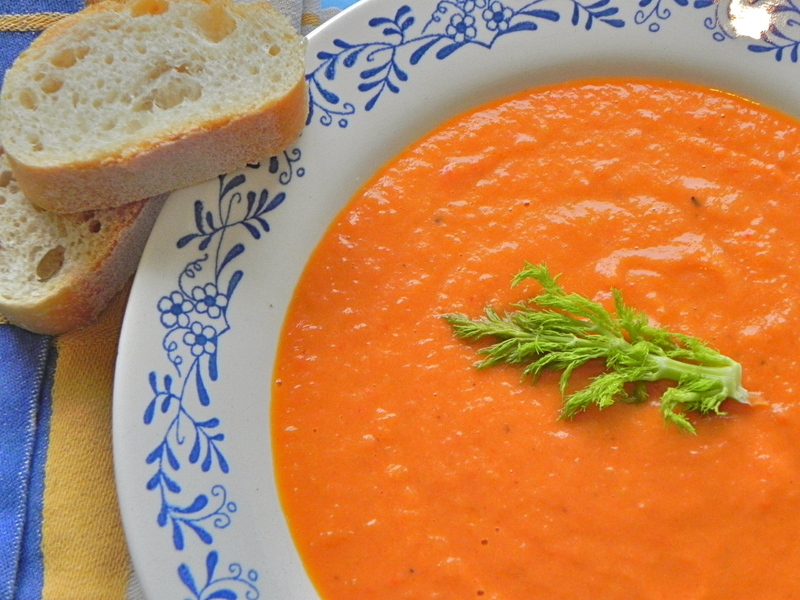 Tomato is blended with fennel, onion and bell pepper, so it is more flavourful and rich than a regular tomato soup. The fennel is distinct, yes, but neither subtle nor over-powering. You can taste it. And the bell pepper gives the dish some sweetness. Of course it is a creamy soup, so there is also the addition of cream. If, like my mom, you want tomato-fennel soup but cannot have the dairy, lactose-free milk will sub in easily enough. It will not be as rich as 10% cream – how could it be? – but it is only a ½ cup either way. Maybe add a spoonful of (lactose-free) yogurt on top to be stirred in at the table? Grilled cheese is an automatic paring for this soup; but rustic bread, garlic toast, or focaccia would also fit the bill. 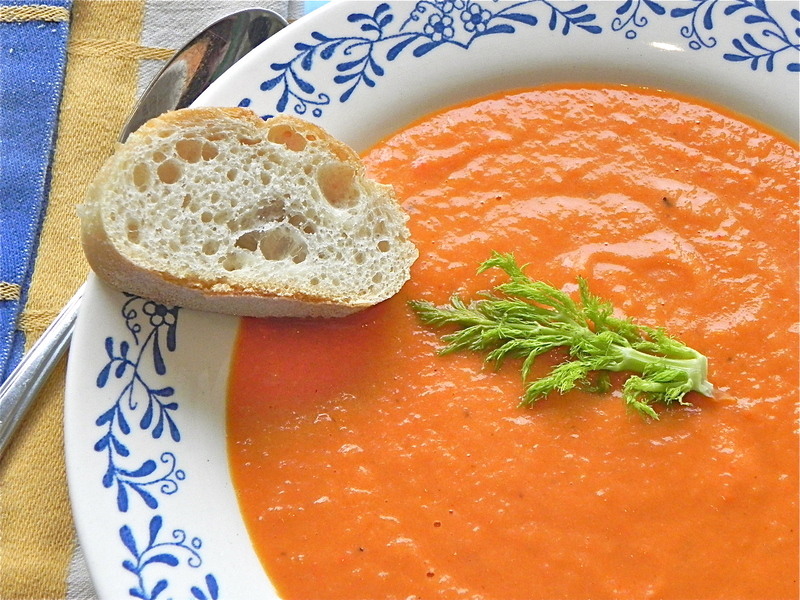 Or serve fennel-tomato soup as an appetizer to dinner, rather than as it’s own meal… like at a restaurant, but better. The fennel will be present in name and in soup. This makes a small batch of soup (maybe 4 servings? ), but can easily be doubled. Toss fennel pieces, pepper pieces and 1 tbsp olive oil to coat the vegetables; spread on a small baking tray or pan and bake for 20 minutes at 400F. Meanwhile, in a large pot, soften the onion in 1/2 tbsp olive oil over medium low heat. Once all the vegetables have cooked, add the fennel and peppers to the onion in the pot, along with the remaining ingredients. Bring to a boil, then reduce and simmer 10 minutes. Puree until smooth. Previous how do you feel about cupcakes?